K.S.A. 58-2202 explains that "every conveyance of real estate shall pass all the estate of the grantor therein." K.S.A. 58-2202 states that transfers in ownership of land are valid when a deed is executed by someone with an ownership interest in the property. K.S.A. 58-2204 provides the statutory form for quitclaim deeds, including the minimum requirements and correct language. The necessary information includes the names and addresses of all grantors and grantees, a complete legal description of the property, the consideration (usually money), and the notarized signature of the grantor or an authorized representative. K.S.A. 58-2209 reinforces the requirement of the grantor's notarized signature. K.S.A. 58-2211 expands the discussion about who may acknowledge the instrument to include those authorized by uniform law to perform notarial acts. K.S.A. 28-115 states that all signatures must have the signor's name typed or printed immediately below them. Finally, K.S.A. 58-2221 adds the obligation to include details about the transaction in which the grantor gained ownership of the property. In addition, be certain that the document contains an appropriately descriptive heading (in this case, "Quit Claim Deed). *	Legal-sized paper (8" x 14") is the maximum size for recording without a non-standard document fee. *	The document must be printed in minimum 8-point type. Kansas follows a "race-notice" recording statute, as described in K.S.A. 58-2222, 2223. Every written instrument, such as a quit claim deed, submitted for recording as directed, imparts constructive notice to all subsequent bona fide purchasers (buyers for value). Unrecorded deeds only provide actual notice to the parties involved with the conveyance, but because they are not entered into the public record, future buyers might not be aware of the change in ownership. For example, let's say that the grantor quit claims his/her rights to the real estate to grantee A, who fails to record the otherwise properly executed deed. Then the grantor quit claims the same property to grantee B, who records the instrument according to the statute. By presenting the deed for recordation, grantee B enters the transaction into the public record and, as a result, will generally prevail in a dispute about the real owner of the parcel of land. 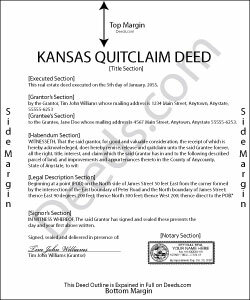 In short, recording the quit claim deed as soon as possible after it is executed is one of the simplest ways to preserve the rights and interests of both the buyer and the seller.